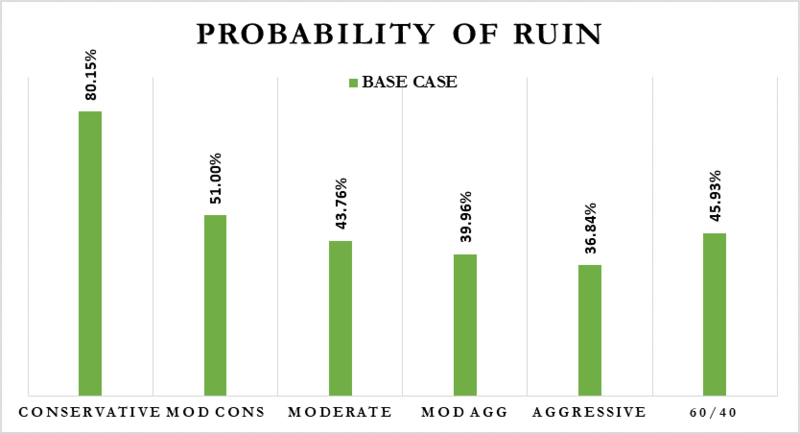 What’s your “Probability of Ruin”? Many people considering retirement or in the early phases of this new stage in life worry about outliving their assets. These individuals no longer have the luxury of a steady paycheck, and unless they are one of the lucky ones with a defined benefit plan and/or a large portfolio of liquid investments, they will have to dip into their 401k’s and savings to fund their lifestyle. Somebody in the de-accumulation phase will naturally worry about how long their money will last and whether they can maintain their lifestyles. People are living longer these days and it is not unheard of for a newly minted retiree to live another 30 years. Let’s look at the data. 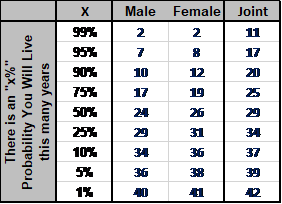 According to the Social Security Actuarial Life Table (2014) estimates, life expectancy for a 65 male is 17.81 years and for a female 20.36 years. Somebody in above average health may live even longer – these are just median numbers. If you want to conduct your own calculations, you can refer to How Long Will You Live? David Blanchett of Morningstar uses the 2012 Society of Actuaries annuity table to estimate the likelihood of living to a certain age using the methodology outlined in his 2013 FPA journal article. This cohort of individuals comes from a higher than average socio-economic group and tends to live longer than average. Table 1 highlights the calculations from the perspective of a 65-year-old. There is a 50% chance that a male lives to age 89 with a female living to age 91. The point of these projections is that most people should plan for a long period in retirement. The good news is that we are living longer today but the bad news is that we need to make our retirement savings last longer if we are to maintain a certain lifestyle. Some people retire with very healthy nest eggs that, barring a cataclysmic event, will provide plenty of cash to fund their lifestyles. They need not worry much as long as assets vastly outstrip expenses. They have a high margin of safety. For most retirees, however, the margin of safety provided by their financial assets in relation to their expenses is slimmer. They do need to worry about how much they are spending, how their investments are performing and how long they may need their portfolio assets to last. They may have other sources of income such as Social Security but still need to make their investment portfolios work hard to bridge the gap between lifestyle expenses and sources of income. They can control their expenses to some extent (putting off non-essential expenses). They can plan and make sure that their investment portfolios are structured in accordance with their appetite and need for risk-taking (maybe requiring the help of a financial professional). But what they can’t control are capital market returns and how long they need to tap into their retirement accounts (how long they will live). 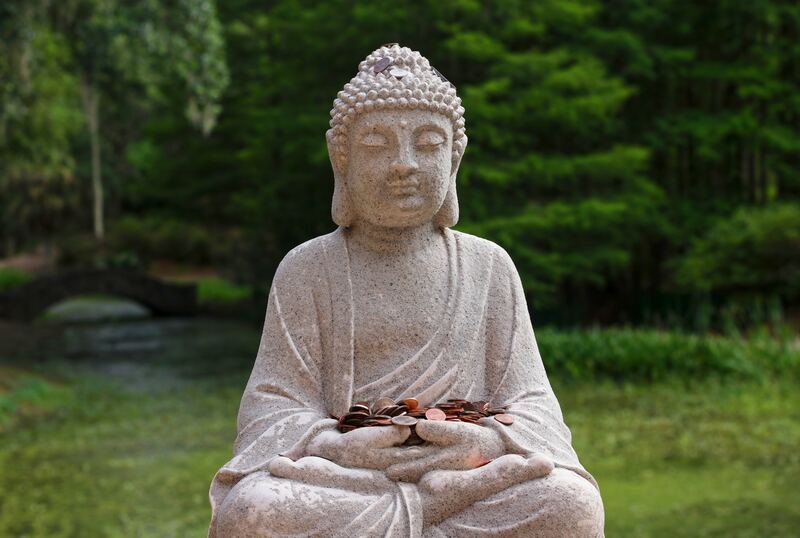 One way to identify the various trade-offs required to ensure the sustainability of an investment portfolio is to come up with a CHRIS, a Comprehensive Holistic Retirement Investment Strategy with the help of a financial professional. A good plan should clearly outline what actions you need to take and what type of minimum portfolio return you will need to achieve to ensure that the probability of running out of money before you or your partner/spouse die is within your comfort zone. Another alternative is to forego a formal financial plan and utilize some sort of rule of thumb such as William Bengen’s 4% rule. According to this highly popular rule published in 1994, you can safely withdraw 4% of your capital every year in retirement. The research contains a number of key assumptions (such as a 50/50 stock/bond allocation) often ignored in the popular press, but the Bengen rule is not only well known but popular among many retirees. Should one just jump ahead in and rely on the Bengen 4% rule? Our view is that before you do so, you really should understand the probability of running out of money. Milevsky and Robinson identify three important factors: your rate of consumption, the risk/reward structure of your portfolio, and how long you live. 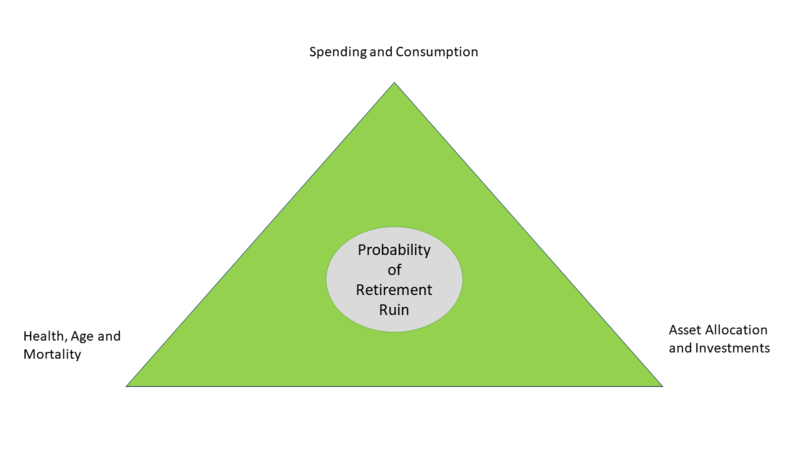 Visually, these concepts can be illustrated in a Retirement Finances Triangle as depicted in Figure 1. Without going into the mathematics of the Milevsky and Robinson approach for calculating a “probability of ruin” lets us think a bit more deeply about what makes retirement planning complicated in the first place. The first aspect that makes retirement planning difficult is the uncertainty surrounding how long you and your spouse/partner are going to live. People are living longer, on average, than in previous generations. But an average does not necessarily help you. Your physical and mental health could be dramatically different from the “average” individual. The other variable that is highly uncertain and makes retirement planning more difficult relates to the variability of investment outcomes on your retirement portfolio. While history is a guide as to what to reasonably expect in terms of key asset class returns and risks over the long-term, in any given year returns could fall within a wide range. As most people already know, stock returns exhibit more variability in outcomes than bonds. 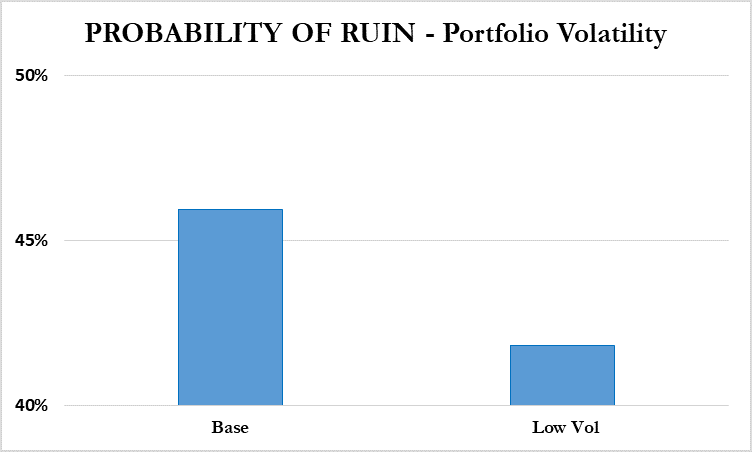 The “probability of ruin” calculation using the Milevsky and Robinson formula incorporates the ability of individuals to evaluate the implications of various forms of asset allocation with varying levels of expected risk and return. 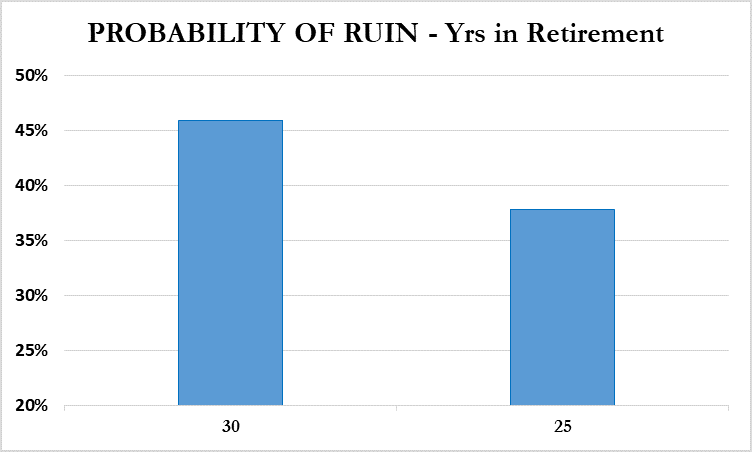 As you have probably figured out by now, calculating the “probability of ruin” is extremely important in planning your retirement. To make the situation more realistic let’s look through the eyes of George and Mandy, both aged 65 and about to retire from their corporate jobs. They have saved diligently over the years and now have a portfolio worth $1,000,000 that they will tap to fund their lifestyle in retirement. George and Mandy estimate that they will need $90,000 a year to maintain their lifestyle. Their Certified Financial Planner has also told them that their Social Security income will be $50,000 a year. They face an annual gap of $40,000. They expect to tap into their retirement portfolio to fund this gap. They are in reasonably good health and based on discussions with their financial planner they assume that they will live to age 90. To be safe, they assume a retirement horizon of 30 years. Their starting portfolio value is $1,000,000 and they wish to withdraw $40,000 a year to fund their living expenses. We assume that inflation will run 3% per year, on average. Currently, inflation is running a bit lower than 3% in the US but the historical average is only slightly north of 3%. What sort of investment risk and return assumptions should people use to calculate the probability of running out of money under this scenario? Past returns are often a poor guide in forecasting returns and George and Mandy decide as a starting point to use the current Insight Financial Strategists long-term capital market assumed risk and return numbers as outlined in Table 2. These numbers are derived from expected long-term growth, profitability and starting valuation relationships. They should be viewed as purely hypothetical and subject to great variation. For illustrative purposes only, Insight Financial Strategists has aggregated all the asset class risk and return numbers into six multi-asset class strategy portfolios according to investment risk – Conservative, Moderate Conservative, Moderate, Moderate Aggressive, Aggressive and the industry convention of a 60/40 balanced strategy. It always helps to start off with a hypothetical scenario where all decision elements are known with certainty up front. We assume that George and Mandy own a 60/40 portfolio returning 4.9% per year and an annual inflation rate of 3%. If they were to withdraw the equivalent of $40,000 a year in inflation-adjusted terms what would the required distribution look like over their retirement years? The red line in Figure 1 depicts what would happen to their expenses in retirement if inflation were to rise every year by 3%. What started off as a withdrawal of $40,000 turns into a much larger number over time. For example, after ten years they would need to withdraw $52,000 each year to fund their lifestyle (assuming that their Social Security checks are adjusted annually for inflation as is the current practice). After 20 years they would need to withdraw $70,000 from their portfolio each year and after 30 years (their last year in their calculations) the number would increase to $94,000 annually. Inflation can sure take a bite! In terms of George and Mandy’s portfolio, the assumption is that it will yield 4.9% per year or in inflation-adjusted terms, 1.9% per year. 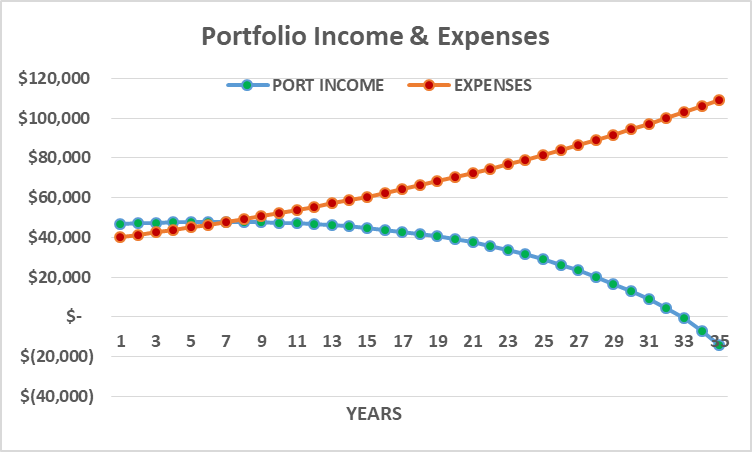 After withdrawals are taken out of the portfolio by George and Mandy to fund their lifestyle net of portfolio returns (the assumed 4.9% nominal return per year) the assumed value of the portfolio is depicted in Figure 2. At the end of the 30th year, the portfolio is expected to be worth $277K. As long as George and Mandy only live 30 years in retirement and the assumed inflation and portfolio returns prove spot on (accurate) then things should be ok. They will glide through retirement and even have some assets left over. The problem occurs if either George and/or Mandy live past age 95. According to the actuarial data in Table 1, there is a 25% chance that George will live to age 99 and Mandy will live to age 101. Now what? Their current $1,000,000 portfolio is now insufficient to fund their retirement expenses past the age of 97. They will run out of money and not be able to rely on portfolio income anymore. What could they do to prevent such an unpleasant outcome? For starters, they could spend less. For example, they could cut back their annual spending to $30,000. They could also shoot for higher portfolio returns by taking on a bit more investment risk. George and Mandy understand that higher portfolio returns are not generated out of thin air. Higher prospective returns are tied to higher risks. But does the real world work like this? Is it just a matter of pulling some levers here and there and voila you have wished for the perfect outcome? Unfortunately, referring to the Retirement Finances Triangle depicted in Figure 1 although there are some things that George and Mandy can control such as their expenses but when it comes to how long they will live and how their portfolio will actually perform over their retirement years there are lots of unknowns. What if George and/or Mandy live longer than the assumed 30-year lifespan? This is what professionals refer to as longevity risk. Living a high quality, long life is a very noble and common goal. Outliving your assets is a real fear. What if portfolio returns do not measure up to our assumed returns? This is referred to as investment risk. What happens if investment returns are significantly below expectations and portfolio income proves insufficient to maintain your desired lifestyle? Most retirees seek some margin of safety in their investments for this exact reason. 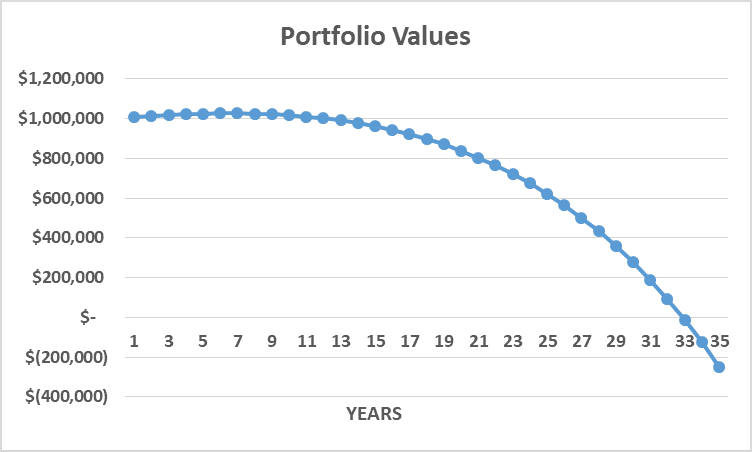 The Milevsky and Robinson formula is designed to take these uncertainties into account by modeling the likely distribution of portfolio returns and longevity. The end output is a probability of running out of money at some point in time over the retirement horizon. They refer to this number as the “probability of ruin”. Let’s start by looking at the implications of the various portfolios strategies presented in Table 1. The Conservative strategy is the least risky approach but also has the lowest prospective returns. This strategy is exclusively composed of bonds. The Aggressive strategy is exclusively composed of equities and is expected to have the highest returns as well as the highest risk of all of our strategies. The 60/40 strategy falls along the middle in terms of prospective portfolio returns and risk. What do the different risk and return profiles of the strategies imply in terms of the probability of ruin of George and Mandy’s portfolio? Figure 3 depicts graphically the output from the Milevsky and Robinson formula. What immediately jumps out from the bar charts is that the probability of ruin for the various portfolios is quite high. No longer assuming that everything is perfect creates, not surprisingly, more difficult likely outcomes. For example, if George and Mandy were to employ the Conservative strategy yielding an assumed 2.3% annual return there is an 80% probability of them running out of money at some point in retirement. Being conservative has its drawbacks! What if they had the internal fortitude to employ the all-equity Aggressive strategy yielding a prospective return of 6.8% with a volatility of 17%? Their probability of ruin would drop to 37%. Even if they employed the conventional 60/40 strategy, their probability of ruin would still exceed 45%. What if the probability of running out of money is too high? Well, for starters they could reduce their rate of consumption, i.e. spend less. Maybe not what they wanted to hear but possible. Let’s assume that instead of taking out $40,000 a year from their investment accounts they withdraw only $30,000? Let’s also assume that they invest in the traditional 60/40 portfolio. The only thing that has changed from the previous scenario is that now George and Mandy are spending only 3% of their initial portfolio to fund their lifestyle. By spending less and thus depleting their investment assets at a slower rate, they lower their probability of running out of money at some point over their remaining lives to 30%. George and Mandy start thinking that maybe searching for a more inexpensive vacation option makes sense and allow them to worry less about outliving their assets. What else can they do to shift the odds in their favor? Besides spending less, another option is to work a bit longer and postpone their retirement date. Let’s say they both work five years longer than originally planned. What would happen assuming that they still intend to withdraw $40,000 in portfolio income and they invest in the 60/40 strategy? By delaying retirement for five years George and Mandy lower the probability of running out of money to below 38%. Not bad but maybe not quite to their satisfaction. Could George and Mandy restructure their investment portfolio to improve their odds? Yes, that is certainly a feasible approach as we already outlined in Figure 3. Higher return strategies carry higher risk but when held over the long-term tend to lower the probability of running out of money. But not everybody is equally comfortable taking investment risk even if it is likely to result in higher ending portfolio values over the long-term. Is there another approach to design a more suitable retirement portfolio? While risk and return are inextricably intertwined, recent financial research has identified the “low volatility” anomaly where lower volatility stocks outperform their higher volatility cohorts on a risk-adjusted basis. See this note for an introduction to the low volatility anomaly. Let’s say that instead of assuming a 10.4% volatility for the 60/40 portfolio we are able to utilize a mixture of similar investment vehicles designed to exhibit lower levels of volatility but equivalent returns. Say the volatility of this strategy is now 8.4% and uses a range of lower volatility fixed income and equity approaches plus possibly an allocation to a guaranteed annuity. Figure 6 illustrates the implications of using the lower volatility investment strategy. 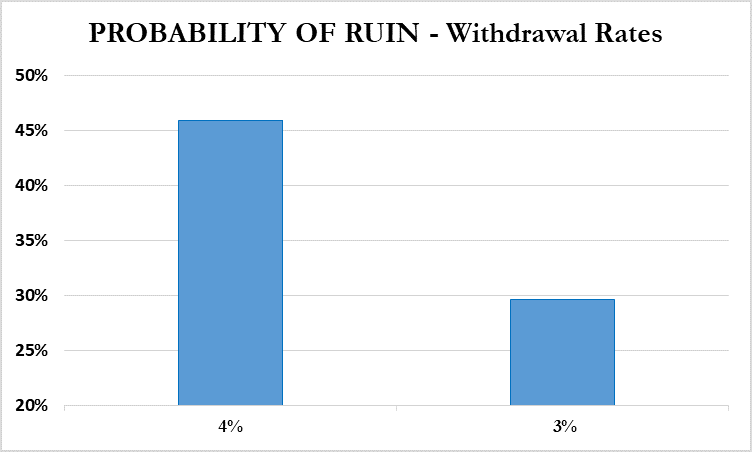 The probability of ruin goes down marginally to below 42%. Good but not great in the eyes of George and Mandy. What else can George and Mandy do? After all, they have evaluated the impact of lowering their expenses, deferring their retirement date and structuring a more suitable investment portfolio and they still are uncomfortable with a probability of ruin in the 30% range. The short answer as in many areas of life is to do a bunch of small things. They could elect to just lower their spending from 4% to 3% and the probability of running out of money would drop to about 30%. Figure 7 highlights the various alternative courses of action that they could take to increase the odds of not running out of money in retirement. There are no guarantees in life, but spending less, delaying retirement and designing a more suitable portfolio lowers the probability of running out of money to about 20%. While we all strive for control, George and Mandy are comfortable with this approach and the sacrifices required. To them leading a fulfilling life in retirement is more than just about money and sacrificing a bit in order to gain peace of mind is a worthwhile trade-off. 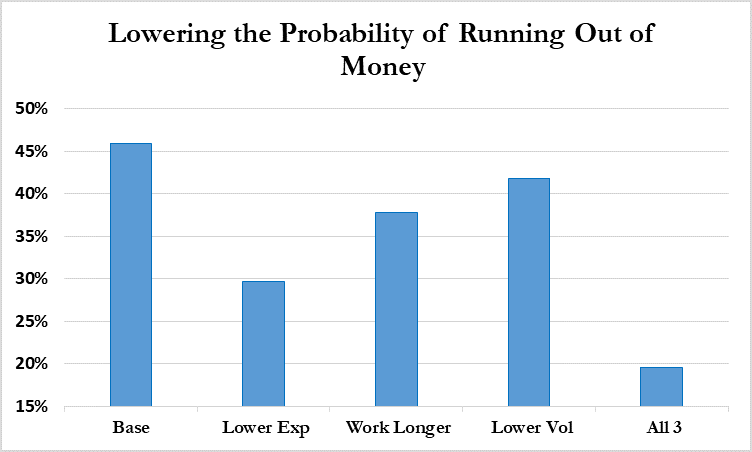 What does calculating the probability of running out of money in retirement teach us? Is the trade-off that George and Mandy are making appropriate for you? Maybe, but maybe not. At the very least, understanding your own circumstances and your own probability of running out of money may lead to vastly different choices. Your retirement could extend for 30+ years. Having enough resources to fund your retirement is important to maintain your lifestyle and achieve peace of mind. As people enter retirement, they can’t eliminate either longevity or investment risk. What they can do is manage the risks and remain open to adapting their plan should things change. At Insight Financial Strategists we don’t believe in shortcuts. A CHRIS, a Comprehensive Holistic Retirement Income Strategy, gives you the best chance of full understanding your circumstances and what needs to happen to fund your lifestyle in retirement. Barring a full financial plan, at a minimum people should evaluate the likelihood of running out of money. Applying the Milevsky and Robinson formula represents a starting point for an in-depth conversation about your needs, goals and especially your attitude toward risk and capacity to absorb losses. Interested in having the professionals at Insight Financial Strategists guide you? Please request a complimentary strategy session here. Information presented herein is for discussion and illustrative purposes only and is not a recommendation or an offer or solicitation to buy or sell any securities. Views expressed are as of the date indicated, based on the information available at that time, and may change based on market and other conditions. 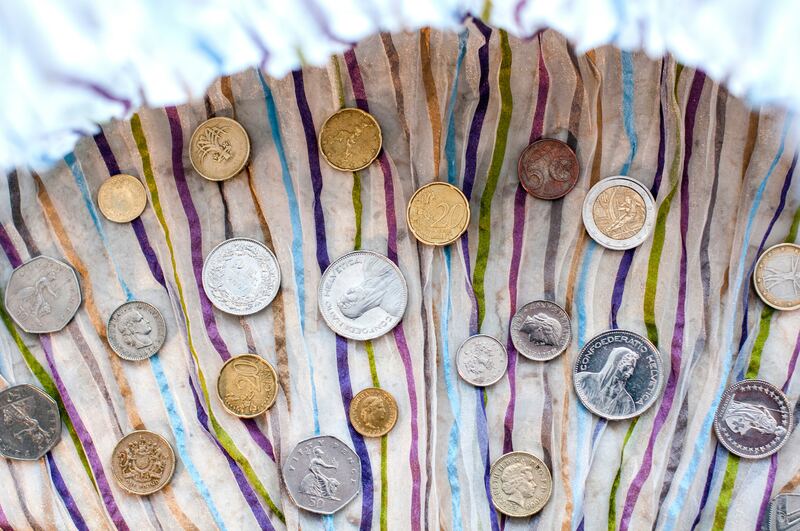 References to specific investment themes are for illustrative purposes only and should not be construed as recommendations or investment advice. Investment decisions should be based on an individual’s own goals, time horizon, and tolerance for risk. Material presented is believed to be from reliable sources and no representations are made by our firm as to another parties’ informational accuracy or completeness. All information or ideas provided should be discussed in detail with an advisor, accountant or legal counsel prior to implementation. This piece may contain assumptions that are “forward-looking statements,” which are based on certain assumptions of future events. Actual events are difficult to predict and may differ from those assumed. There can be no assurance that forward-looking statements will materialize or that actual returns or results will not be materially different from those described here. Stock and bond markets are volatile and can decline significantly in response to adverse issuer, political, regulatory, market, or economic developments. Investing involves risk, including the risk of loss. Eric Weigel was the Chief Investment Officer of Insight Financial Strategists from October 2017 to September 2018. He set the direction of Insight Financial Strategists' investment strategy and worked on helping clients meet their goals. Is Your Caution Today Hurting Your Tomorrow?